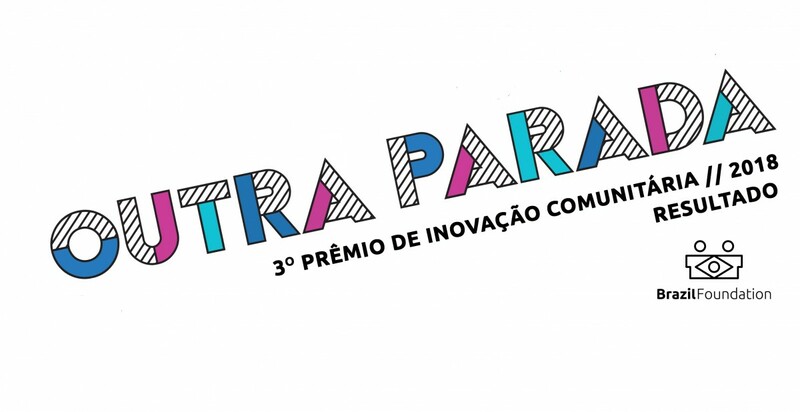 The Community Innovation Award was launched in June to leverage informal social initiatives (“Outras Paradas” in Portuguese). The initiatives were selected by a network of BrazilFoundation partner organizations who would contribute as mentors to strengthen and develop their locales. With its first edition in 2015, the award was created to meet the urgent demands of the social sector, democratize access to resources, encourage local leadership and incubate innovative social technologies. In May, 2018 BrazilFoundation launched the third edition of the award to support 53 initiatives with R$ 6,500 in seed investment, R$ 5,000 of which will go to the project itself and R$ 1,500 for monitoring and mentoring costs.This year, 21 mentor organizations, all previously supported by BrazilFoundation, are participating in the award. The organizations represent 16 Brazilian states and helped identify and map 190 initiatives in their locales, from which 53 were selected to receive mentoring, resource monitoring, and results evaluation. This model of “participatory philanthropy” aims to fund initiatives that exist outside the radar of other investors because they are not formalized; democratize resource allocation, test the idea that grantee organizations can be grantors, encourage local leadership development and create an ecosystem that favors the creation of new social technologies. Funds for the III Community Innovation Award were raised through a partnership with Itaú Social, from the Gala Miami, and from the Bronxville Youth Council. Helping students develop critical thinking skills and abilities for them to engage and act as conscious citizens. Supporting beekeeping in the Amazon to promote biodiversity conservation and strengthen the BR 310 women’s network. A theater that uses various approaches to discuss current challenges in the school community of Maré, fostering a network of artist multipliers. Helping children and adolescents under state care to find housing and a potential family. Strengthening a youth organization that does beekeeping and raises goats and hens, encouraging youth to stay in the field while promoting income generation and respect for nature. A network to help women facing domestic violence, and a sewing cooperative that will teach the women entrepreneurship and income generation skills. Teaching youth percussionists the history of percussion pop culture while working with the community to become more involved in the project. Offering practical and theoretical capoeira classes for kids and teens, seeking their physical and social development. Offering a space that provides educational, sport, leisure and cultural activities to socially vulnerable children, adolescents, and residents. Providing children living in remote areas of Morro do Alemão or vulnerable situations access to cinema, culture and leisure activities. Providing the residents of Tauá access to different genres of cinematic production to stimulate learning, family and community integration and socialization. Ecotourism and rural adventure tours, stimulating environmental awareness, income generation and independence for the local community. Bringing music therapy and discussions about gender equality to schools to stimulate reflection on social roles. Preserving the embroidery art of Nice Firmeza, an artist from Ceará, through local artisans while also promoting the art as a form of income generation and independence for them. Primeira creche na comunidade indígena Pataxó Hãhãhãe, baseada nas tradições e cultura local e utilizando um modelo participativo. Promoting the physical, mental, and spiritual well-being of women facing violence through meetings and care practices. Holding group environmental activities and teaching families about stingless bees. Creating an informal production line of sweets and regional fruit jams, strengthening ties and diversifying the income of women farmers. A documentary that aims to contextualize the participation of the women who are in the process of occupying the Engenharia neighborhood. Promoting environmental education in schools, clinics, and community centers to heighten environmental awareness and improve health. Implementing a solid waste management system with educational environment activities in a school in Goiânia. Providing a platform for the experiences of women in MMNEPA, who organize themselves to resist a system of social oppression. Reviving quilombola identity, strengthening the community and improving self esteem by providing training in beauty and aesthetic for quilombola women. The initiative will also promote knowledge sharing between these women. Futuro em Movimento – Rio de Janeiro, RJ | Lucia Maria Oliveira Leite. (EDUCAP). A teen-oriented project with dance and handicraft workshops to generate immediate income through recycling (trash becomes luxury). Offering a space of support and care for people living with Lupus and their families. Giving kids the opportunity to build healthier cities through fun, playful experiences with the city. An informative course for beekeepers seeking a growth in sales and income, making new commercial opportunities possible. Meditation workshops for children and adolescents as a method of prevention psychology and way to boost their self esteem and self care. Holding workshops to build musical instruments and promote the inclusion of children and adolescents. Building a vegetable garden integrated with the raising of free-range chickens in the form of a mandala, contributing to meal security, nutrition and income for families. Youth from favelas coming together in public spaces in Rio to raise questions about rights, identity, culture, and politics. Popular dance workshops that integrate dance, storytelling, and set design activities with the women of Maré. A crafts course using camalote fibers, a typical plant from the Pantanal, as an employment and income generation opportunity for regional women. Rap groups from Belo Horizonte and the surrounding region holding Hip Hop events for youth. Holding stop-motion and collective script writing workshops to improve the relationships of children with the space and social context in which they live, while fostering positive relationships with technology. Teaching children about the work of Carolina Maria de Jesus, allowing them to become familiar with the author and to reflect on social inequalities. Kids producing YouTube videos, encouraging their protagonism and leadership while teaching them how to use the technology. Racial, genre and audiovisual training for women to produce a documentary about the history of Prainha, a peripheral community of Mariana. Teaching public schools and children’s institutions techniques for cultivating organic vegetable gardens. This is a potential tool for environmental education and generating income. Reviving the culture of artisanry, strengthening ties, empowering women heads of households and creating income generation opportunities. Supporting and empowering women to create income generation opportunities and promote family agriculture. Quem Conta Um Conto – Dias D’ávila, BA | Alberto Damit, 53. (Instituto Cultural Pólen). Workshops for storytelling in public schools to increase student interest in reading and decrease school evasion. Training community reporters from areas affected by the Fundão dam to work on the Sirene newspaper and more. A space adapted for people with deficiencies to receive physical therapy, occupational therapy, psychopedagogy, psychotherapy, phonoaudiology and social work provided by volunteers. Professional training to promote income generation for low-income and pregnant women, preparing them for maternal care. Photography, music and writing workshops for public school students, with the objective of capturing the experiences of living in the periphery and promoting appreciation for these communities. The project will also teach the students to share this knowledge. Artisanry and indigenous dance workshops to help preserve the terena language and generate income. Using the circus arts to prevent children and adolescents from entering criminality in a community marked by violence. Fostering leadership in youth from rural communities surrounding BR 319 through socio educational and cultural activities. Outdoor reading workshops, storytelling and rhythmic games for children in public spaces. Empowering people from the LGBTQ+ movement who are living with HIV/AIDS. Promoting a culture of peace and the better health for residents of Complexo da Maré through yoga and meditation.